This charming and endearing little sampler was worked by Phebe Carter in 1794. Worked on unbleached linen, it contains an alphabet as well as a numerical progression of 1 to 6. In the center of the sampler Phebe has worked a wonderful twin chimney house flanked by two trees. 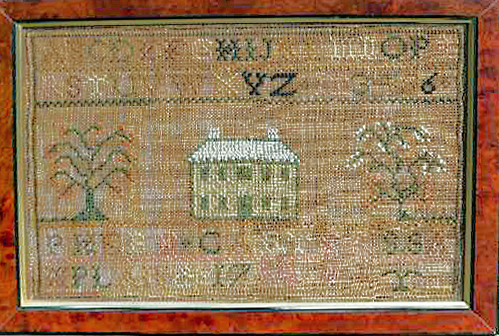 At the bottom of the sampler, Phebe tells us that the piece is Phebe Carter's Sampler and the date 1794. I had a terrible time getting a good picture of this piece as it is mounted on a light colored acid free board and the white is showing through. (Camera playing tricks.) The overall color of the ground is even and the color of light toast. The house is yellow with a white roof and has olive green trim. Overall it presents a very nice, soft appearance and is very folky. Charming in its simplicity and in its naivete, it is obviously the work of a very young girl. Worked in silk on linen, it is in excellent condition and conservation mounted into a beveled burl veneer frame with a gold liner. It measures 10-1/2 inches x 7 inches (sight) and 12 inches x 9 inches overall.